The Loring Park District is a cultural hub where old meets new and diverse populations intertwine. Home to both the city's LGBTQ Pride festival and the nation's first basilica, the area's rich history and bold cultural institutions are among the best in the Twin Cities. Stroll along the neighborhood's streets, and you'll see a mix of 19th century brownstones alongside modern condos, not to mention hundreds of hotels, shops, and some of the best eateries outside of Eat Street. The district is located on the southern edge of downtown Minneapolis, making it an easy distance from the city's busiest sports venues, business districts, and major interstates. Even with the Minneapolis Convention Center inside its borders, Loring Park's ample green spaces and remarkable walkability make it a nice reprieve from the city's bustling downtown. Whether you're just visiting or a long-time local, here's where to go when visiting Minneapolis' Loring Park District. You can't visit the Loring Park District in Minneapolis without visiting its namesake. 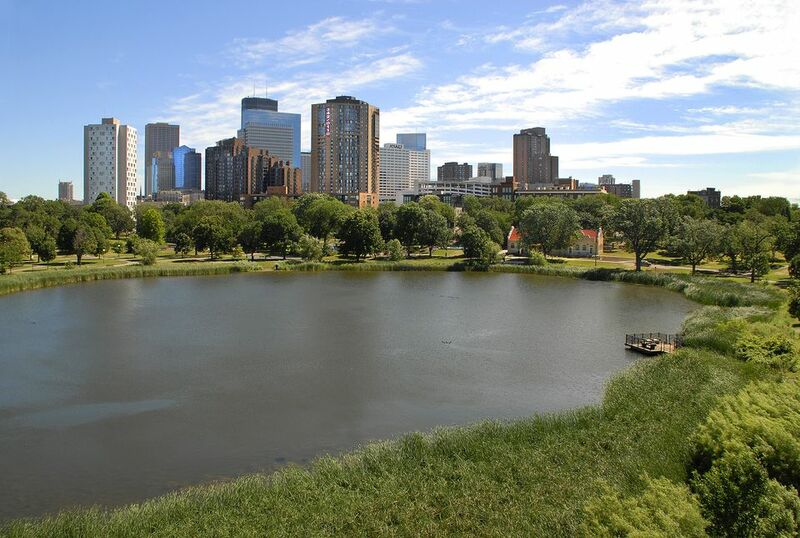 Loring Park was established in the late 19th Century and has become one of the Twin Cities' largest and most popular public gathering places. In addition to hike and bike trails, playgrounds, and picnic areas, the park boasts an ice rink and wading pool (both seasonal) and a fishing pier. Loring Park is also home to some of the city's most popular events and festivals — most notably the Twin Cities Gay Pride Festival. Every June, roughly 400,000 LGBTQ individuals and their allies march down Hennepin Avenue in the annual Pride parade and then gather in Loring Park for one of the largest such celebrations in the United States. In the winter, the city's free winter festival, Holidazzle, also takes place in the park, boasting thousands of lights, live music, ice skating, fireworks, and tons of local vendors. The festival takes place Thursdays through Sundays from Thanksgiving to Christmas, and — like the Holidazzle Parade that preceded it —it has become a can't-miss holiday tradition for Twin Cities-area families. Just across the Hixon Whitney Footbridge sits the Minneapolis Sculpture Garden and adjacent Walker Art Center — two of the top art institutions in the city. The 11-acre sculpture garden is always free and open to the public from 6 a.m. to midnight, and features dozens of bold and innovative works of art, including the iconic Spoonbridge and Cherry seen on so many Twin Cities postcards. The piece, created by Claes Oldenburg, was inspired by 1960s pop art and stretches more than 50 feet long. It was the first piece commissioned for the sculpture garden and is a favorite among locals. Next door, the Walker Art Center houses an eclectic series of galleries that include both static and dynamic pieces. In addition to the art museum standards of paintings and photography, Walker also includes tons of unique multimedia projects, live performance pieces, books, and costumes. Be sure to check out the museum's busy events calendar for upcoming shows and movie screenings, as well as its always-changing exhibitions. Between the garden and art center, you could easily spend a whole weekend immersed in the expansive collections. Minneapolis is gaining a lot of traction with its craft brewery scene, and few things pair better with a brew than some savory smoked meats. After opening in 2012, Butcher & the Boar quickly became one of the city's most popular eateries because of its high-quality steak and house-smoked meats, smooth bourbon, and dozens of craft beers on tap. Much of the food is sourced locally and from premium vendors, and food is prepared with communal dining in mind — boasting huge portion sizes that are oh-so-satisfying. Butcher & the Boar is trendy while still being accessible, with the bulk of its decor featuring real wooden tables and exposed beams. When the weather is nice, hit up the patio or covered beer garden for downtown views, or cozy up by the outdoor fireplace during the winter. This hip, innovative cafe and bar is a favorite among locals throughout the Twin Cities. Lurcat features a wine list with some 200 options, as well as delicious craft cocktails, and tasty American eats. Many of the tables offer views of Loring Park across the street, but the real treat is the patio. Crisp, white linen tablecloths contrast with exposed brick walls and large potted plants for an elegant atmosphere that's perfect for date night. Swing by any day of the week from 4:30 to 5:30 p.m. for happy hour deals like $5 burgers and beer or $7 cocktails. Or check out the Sunday night date menu, where for $50 a couple, you'll get a starter, entree, dessert, and half-off bottles of wine. Cap off the evening with a show at the Orpheum Theater or a stroll around the park, and you have the makings of a truly romantic evening. Besides being a stunning work of structural art, the basilica is still an active church and meeting place for the Minneapolis community. Mass is held every Sunday, and charity services are facilitated year-round. It also hosts cultural events throughout the year. The church houses an art gallery with religious-themed artwork and installations, and every year it hosts its annual Icon Festival that features concerts and art exhibitions. Take a self-guided tour, or join free docent-led tours on Sundays after mass or during the week by appointment. If you do the self-guided route, the church staff appreciate a call ahead of time so that they know you're coming. There's no entrance fee for visiting the church, but free will donations are accepted. While not technically considered part of the Loring Park Neighborhood, several live music and theater venues are less than a mile from the park and within easy walking or biking distance away when the weather is nice. Whether you prefer musical theater, rock concerts, or classical opera, there are a few nearby venues that are worth a visit. First Avenue is a must-see for avid music buffs visiting the area. The live music venue is perhaps best known for its appearance in Prince's "Purple Rain," but it's also an incubator for up-and-coming talent. The venue has two performance spaces — one larger stage known as the Main Room that hosts big-name artists, and another smaller space called 7th St Entry that features local bands seven nights a week. The Orpheum Theater and State Theater both offer a mix of classic and modern live theater performances, including Broadway productions and operas. When the theaters opened in the early 1920s, they were each historic in their own right. Originally a cinema and concert hall, the State Theater was largely considered the nation's most technologically advanced theater of its day because of its up-lit glass stage and state-of-the-art air conditioning system. In contrast, the Orpheum, with capacity for more than 2,500 audience members, was the largest vaudeville house in the United States and was once owned by beloved Minnesotan musician and rock legend Bob Dylan. If you're more interested in the theaters themselves than a performance, the Hennepin Theatre Trust periodically hosts tours of both buildings for visitors ages 8 and up, where guides share information on the theaters' history, architecture, and interior rooms not often seen during live performances.